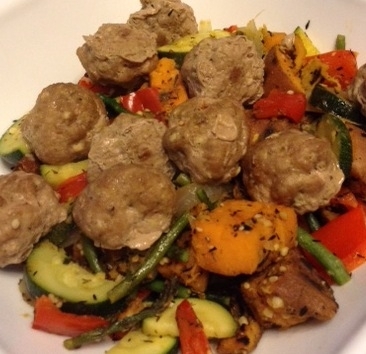 A quick-cooking balanced meal combining three favorites: meat balls, roasted potatoes, and stir-fryed veggies! Spray PAM on a pan and sear potato cubes with a lot of rosemary and thyme. keep on heat until cooked. Remove meatballs from oven and add to the pot. Enjoy!